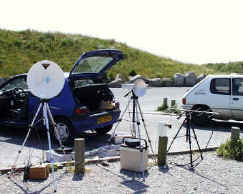 What is believed to be the first 47GHz contact between the UK and an overseas country took place on Friday, 25 June 1999, when G3PYB/P and G8ACE/P (the UK 47GHz record holders) worked Hans, F/PA0EHG who was located across the English Channel at Cap Blanc Nez, some 34km from the two G stations who were just a few hundred metres from Dover Castle in Kent. Between the two locations a line off sight existed and with binoculars the other location was vissible. The contacts took place around lunchtime (G3PYB/P at 12.12GMT and G8ACE/P at 12.20GMT. Signals were exceedingly strong both ways, and F/PA0EHG was able to copy G8ACE/P;s 150 microwatts SSB on just a feedhorn. Hans transmitted CW though SSB would have been easily read. details of the antennas are available as yet. Equipment at the French end is a 12 mW TX and a DB6NT mark2 RX. Antenna was a 24 cm dish. 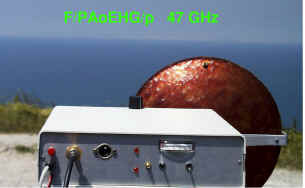 This contact is believed to be a G-F 47GHz first and most likely a first overseas contact on the band from the UK. 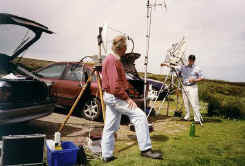 G and PA on 47 GHz.